An iPod docking station that also doubles as a radio alarm clock has been launched by accessories company Logic3. 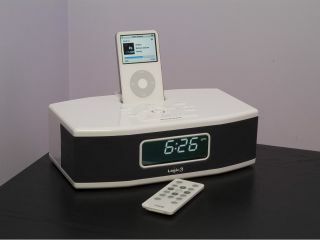 The i-Station Clock Dock is an iPod docking station that can wake you up with sounds from your iPod. Any iPod will fit it, and the system offers a 2.5mm stereo line input so you can plug in other MP3 players too. Available in white or glossy black, the i-Station Clock Dock comes with a remote control, so users can skip tracks, switch on the radio, adjust the alarm clock - or hit the snooze button - without getting out of bed. Usefully, two separate alarm times can be set on the i-Station Clock Dock alarm clock, and the display can be dimmed with three brightness settings available. The i-Station Clock Dock will be available in the UK from high street stores and online from Amazon from September, priced at £49.99.